SUBHEAD: Republicans will not seek lame duck vote on Trans Pacific Partnership. Thank God! 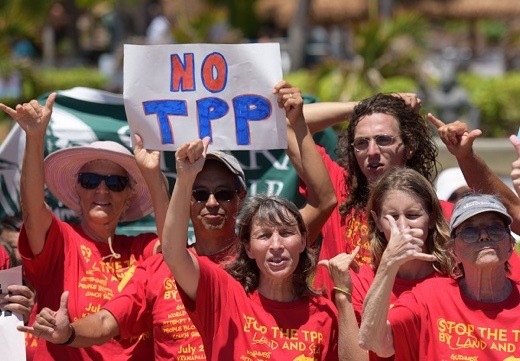 Image above: People attend a rally protesting the Trans-Pacific Partnership (TPP) in Maui, Hawaii, the United States, July 29, 2015. From (http://thebricspost.com/if-tpp-fails-us-will-cede-trade-leadership-role-to-china-us-trade-rep/#.V8M86LUnqe8). Senate Majority Leader Mitch McConnell said Thursday that the U.S. Senate will not vote on the 12-nation, corporate-friendly Trans Pacific Partnership (TPP) this year, buoying progressive hopes that the trade deal will never come to fruition. Responding to the news, Sen. Bernie Sanders (I-Vt.)—whose opposition to the TPP was a hallmark of his presidential campaign—said: "This is good news for American workers, for the environment, and for the ability to protect public health." McConnell told a Kentucky State Farm Bureau breakfast in Louisville that the agreement, "which has some serious flaws, will not be acted upon this year." Grassroots groups have led a concerted campaign to prevent a vote during the so-called "lame-duck" session of Congress, after the November election and before President Barack Obama leaves office in January. The White House recently vowed to wage an "all-out push" in favor of such a vote. "We never thought we would agree with Mitch McConnell on something, but we do agree on not bringing the TPP to a vote in the lame-duck session," said Adam Green, Progressive Change Campaign Committee co-founder, on Friday. "There's widespread, bipartisan opposition to the corporate-written TPP and an unaccountable, lame-duck Congress voting on it." However, The Hill reports, "McConnell said that while the trade agreement won't get approved in its current form, it could pass next year with some changes." "It will still be around," said the Republican from Kentucky. "It can be massaged, changed, worked on during the next administration." Both Republican presidential nominee Donald Trump and Democratic presidential hopeful Hillary Clinton say they're against the deal, but that opposition isn't guaranteed. And that's why opponents need to keep the pressure on. Indeed, added Sanders: "This treaty is opposed by every trade union in the country and virtually the entire grassroots base of the Democratic Party. In my view, it is now time for the leadership of the Democratic Party in the Senate and the House to go on the record in opposition to holding a vote on this job-killing trade deal during the lame-duck session of Congress and beyond." To that end, Reuters notes that earlier this month, Republican House Speaker Paul Ryan "said he saw no point in bringing up the TPP deal for a vote in any 'lame duck' session of Congress later this year because 'we don't have the votes.'"